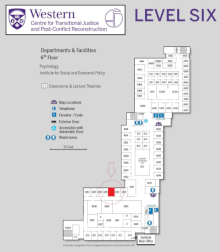 The TJ Centre is moving! Find us in SSC 6250. The Centre for Transitional Justice and Post-Conflict Reconstruction is one of the six governing research centres that encompass the Network for Economic and Social Trends (NEST), which brings together he research centres in the Faculty of Social Science. Our aim is to be a world-wide centre of excellence in scholarship on transitional justice and post-conflict reconstruction through collaborative, interdisciplinary and international research amongst faculty, undergraduate, graduate, and professional students and postdoctoral fellows. A day-long symposium considering the implications of how we choose to categorize different aspects of the transitional justice and post-conflict reconstruction process. Registration is free, but required. Lunch will be provided for those who have registered. We are a centre of excellence in scholarship on Transitional Justice and Post-Conflict Reconstruction through collaborative, interdisciplinary, and international research amongst faculty, undergraduate graduate, professional students and postdoctoral fellows. To make a donation to the Centre, contact Joanna Quinn, Director of the Centre.